So sorry for the long hiatus! Over the winter Carl has been busy! He is the proud Daddy of 9 kits. So far the Mama is not being very good so we are busy hand raising the new babies. The babies were born on Friday the 13th! Here is a picture of a couple. They are getting their colors now and look a little better than they did on day one. Carl, Abby and I worked on sending Mama a present for her birthday and Valentine’s Day while she was away taking care of her mother. Picture of work in progress of the piece. We added pictures to the project to make sure she didn’t forget what we looked like. After this picture was taken, we applied a clear coat to protect our piece. Carl just loved working with this piece of purple heart. Now we are working on a new floor in Mama’s home office. This is where we started. OUT with the old and in with the NEW!!! Mama and Carl worked hard and it’s all out. Time for the new floor. In with the new, guess what she wants. This is how the floor starts. (I know I should be wearing my safety glasses! I sent Carl on a fetch them and he wasn’t back yet.) Every cut is 1-1/4 inches, EVERY CUT!! Carl setup the jig at 1-1/4 inches to make cutting go faster. He went and measured the floor. By his lucky rabbit foot calculations, it should take us roughly 3000 pieces depending on the dimensions of the wood. One down and many many more to go. The remainder of this week and next week we will be working on getting this floor put together and finished up. Carl is going to take it easy and rest over the weekend while we do our rabbit stuff. We will post more next week from the work we complete on the floor this week and next week. We will post Carl’s offspring as they get older too. Until then thank you for following Carl and our wood working adventures. Hopefully Carl will remember my safety glasses for the next cutting session. 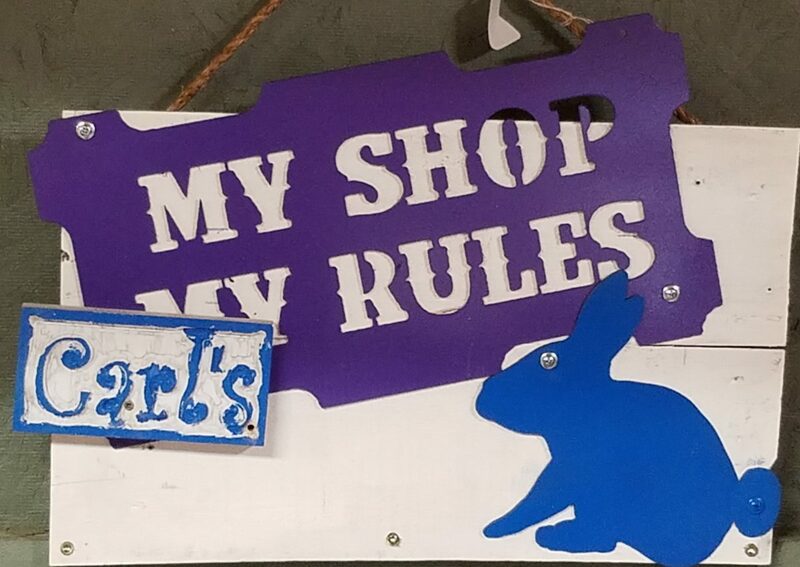 Previous Previous post: What’s Happening in My Shop Carl’s Rules?